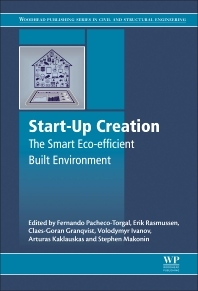 Start-Up Creation: The Smart Eco-efficient Built Environment provides a state-of-the-art review on high-technology applications and explains how these can be applied to improve the eco-efficiency of the built environment. Divided into four main parts, the book explains the key factors behind successful startup companies that grow from university research, including the development of a business plan, the importance of intellectual property, necessary entrepreneurial skills, and innovative thinking. Part Two presents the latest research findings on nano and bio-based technologies and their application and use to the energy efficiency of the built environment. Part Three focuses on the use of genetic algorithms, Big Data, and the Internet of Things applications. Finally, the book ends with an entire section dedicated to App development using selected case studies that illustrate their application and use for monitoring building energy-efficiency. Fernando Pacheco-Torgal is a Senior Researcher in the C-TAC Research Centre at the University of Minho, Portugal. He has authored almost 300 publications, including 96 in ISI Web of Science-WoS and 92 on Scopus. Having received 798 citations in WoS (h-index=15) and 1125 citations on Scopus (h-index=18). He has a SCI Platinum h=30 the highest in the field of civil engineering in Portugal. He has also been the Lead Editor of 14 international books, with more than 500 contributors from 52 countries in the five continents. Erik Stavnsager Rasmussen is an Associate Professor at the University of Southern Denmark. His research areas include international new ventures and born global firms. Professor Dr Habil Artūras Kaklauskas is Head of the Department of Construction Economics and Property Management at Vilnius Gediminas Technical University, Lithuania. Dr. Stephen Makonin is a postodoctoral fellow in Engineering Science at Simon Fraser University. His research interests include data science, big data, computational sustainability, probabilistic modelling, disaggregation, and nonintrusive load monitoring (NILM). Other interests include open science; the making of hardware and software open source and the creation of public datasets.